Does not require a specialised paint formular to work. Can be used with any paint. Why short wave Infra-red curing? 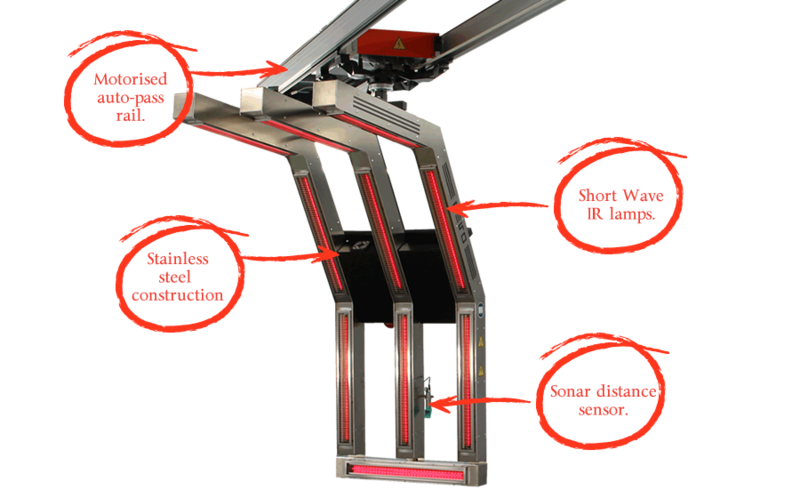 All Revo systems use high short waves quality ruby coated lamps, an instinctive choice taken during the first steps of the Revo project development. 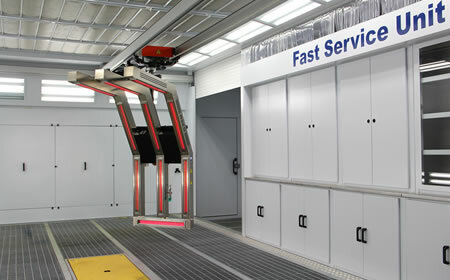 The decision to use electric infra-red is because it is extremely versatile and has unique advantages in performance, making the equipment ideal for use in today’s modern body shops. IR rays emitted by short wave infra-red lamps can penetrate various paint product layers applied onto the surface, reaching and directly heating the lower support. Effectively allowing the paint material to dry from the inside to the outside, ensuring an optimal and complete evaporation of the volatile components and an unmatched curing of the surface. Lamps reach very high temperatures (up to 1200°C) in less than a second and cool down rapidly. 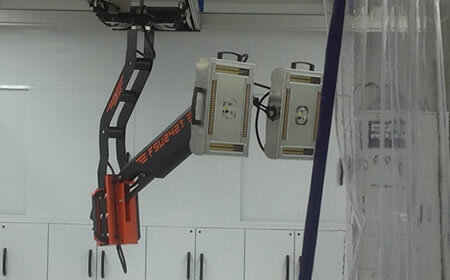 This feature together with the specific software ensures the complete control of the power (from 0 to 100%) allowing full monitoring of the temperature applied to the surface which is to be dried, monitoring every level of moisture and ambient temperature, with every kind of paint material, curing independently from the support material (steel, aluminium, plastic, carbon fibre, wood…). The experience acquired by our staff, thanks to the installation of infra-red drying systems since 1982, is the starting point for the development of Revo systems. Our commitment was to respond to the needs of modern body shops, providing them with the ideal instrument to increase productivity, efficiency and profitability, without altering the painting process and increasing the safety of the working environment. Today the third version of the Revo maintains its versatility, thanks to the fact that it can be installed in almost every new or existing plant; it also gains improved operating speed, further reducing working times and energy consumptions. Today the average extent of the repaired damages is significantly lower than in previous years. 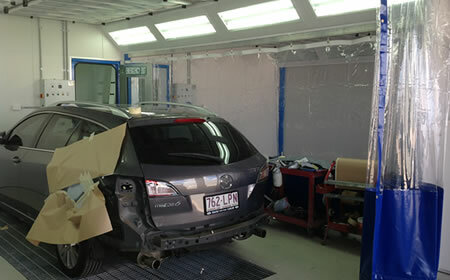 About 75% of vehicles entering body shops only require attention to 3 panels or less, generating the need for more efficiencies when undertaking this type of work. Revo has always been developed to meet these new demands for a quick repair, focusing the drying power only where it is really needed and therefore avoiding wasted time and energy. Resulting in lower repair costs and increased profitability through increased efficiency. Yes, Revo is currently in use in repair facilities and training centers around australia. Its global acceptance by major international and local paint suppliers like PPG, Glasurit, Akzo Nobel and many others make this system an excellent and simple choice. The revo will be at home in any repair bay, saving you time and money with each pass. Already in use throughout Australia. How quickly can we repair, cure and coat a damaged panel with the Revo System? Have a look at how TRUFLOW installed this amazing training centre in SA. What other infra-red options do I have? The answer is many, while the revo is the ultimate in IR curing there is a range of rail mounted Fast service units that can provide an excellent solution for your preparation area. 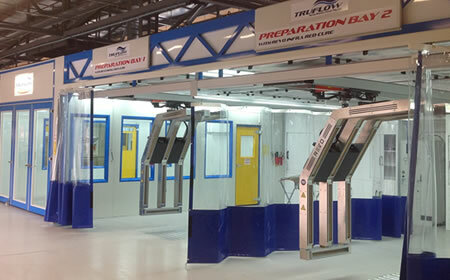 TRUFLOW has a wide range of quick repair bays that can find a home in any repair facility.